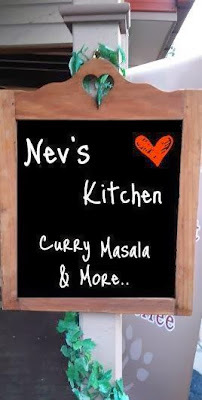 I make this all the time for Mr N and I couldn't deprive my readers of it. For all my vegetarian friends, try this with veggies or potato or even eggs. This recipe is a classic example of a dish that requires longer prep time, but putting it all together is really quick. I dont know if its just me, but whenever I am making this biryani, I feel very happy and calm. It is a stress buster for me and I hope you enjoy it as much as I do. 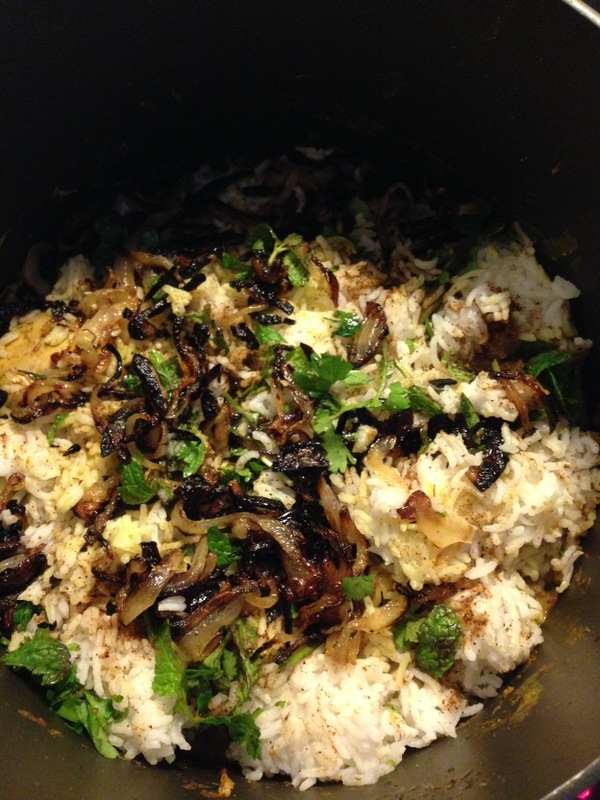 Every layer of the biryani needs to be flavor full, so make the rice this way and you wont regret it. In a pot take 1 full cup of basmati rice. Rinse well 2-3 times & remove all the water. 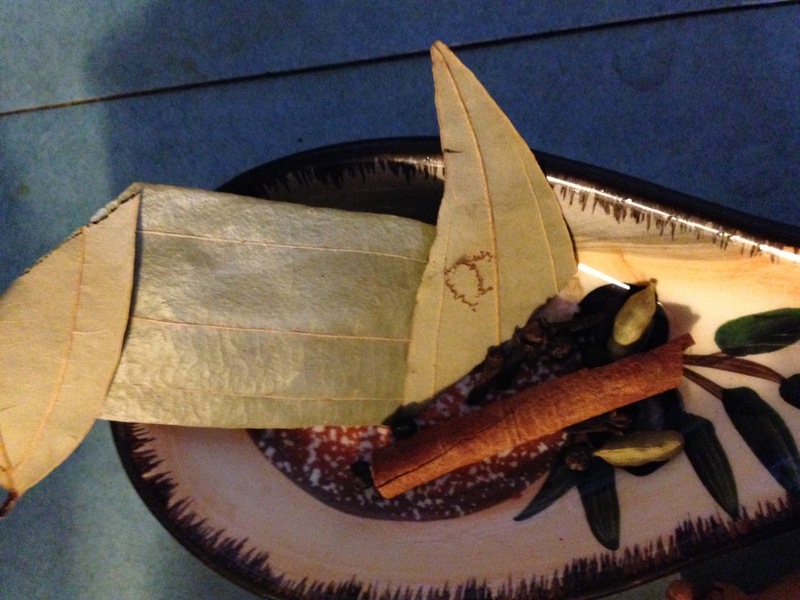 Take a small muslin cloth & add a small stick of cinnamon, 3 cloves, 3 black pepper corns, 1 cardamom pod. 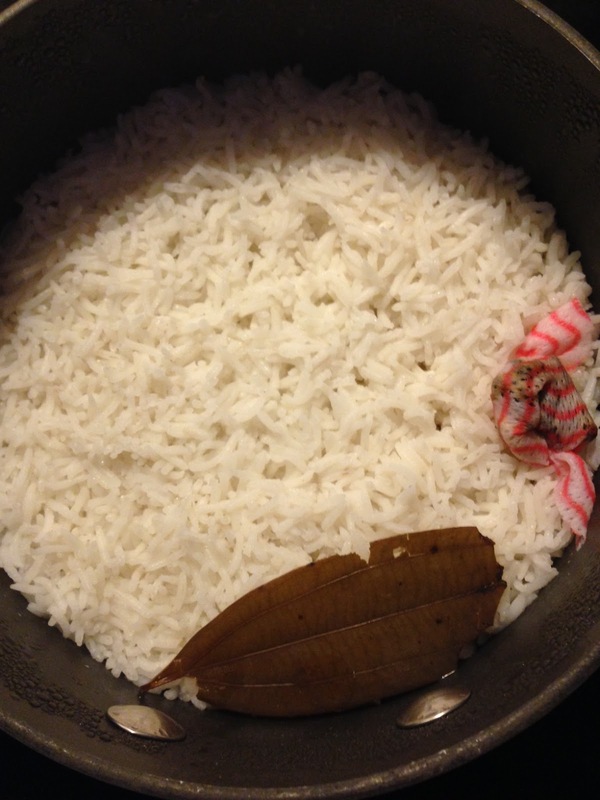 Tie it tightly and place it along with the rice in the pot along with a dry bay leaf. Pour 2 cups of water to cover the rice, spice pouch and bay leaf. Cook covered for 7-10mins. Keep it covered till you need it. 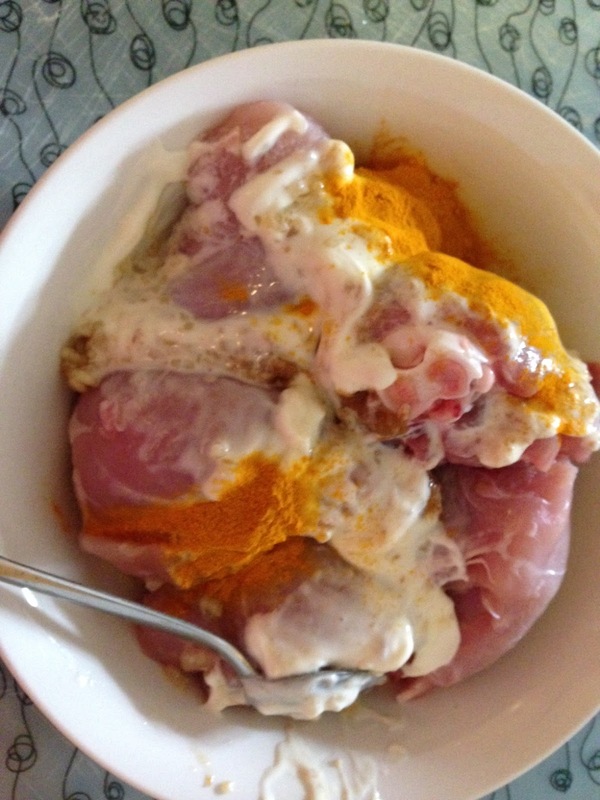 In a bowl place the chicken & coat it with 2 tbsp. plain yogurt, 2tsp garlic paste, 1/2tsp. turmeric powder, 1tsp. chili powder, 2tbsp each of coriander & mint leaves. Mix well with a fork or spoon so the marinate covers all pieces. Let it rest till you prep rest of the recipe. In a deep pot (I use a pasta pot) or a deep sided pan, add about the oil. Add the whole spices (bay leaf, cloves, pepper corns, cinnamon stick, cardamom pods and cumin seeds.) Fry till they develop a slight color. Add sliced onions and cook till they are soft & slightly golden brown. Add ginger & garlic paste. Saute till raw smell from the paste is gone. 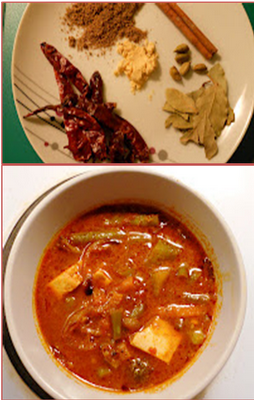 Add tomatoes and dry spices, turmeric, chili, garam masala, and salt to taste. Mix well. Cook till tomatoes are reduced to half. Now add the yogurt. Cook for 2-3 mins, stirring to blend everything. 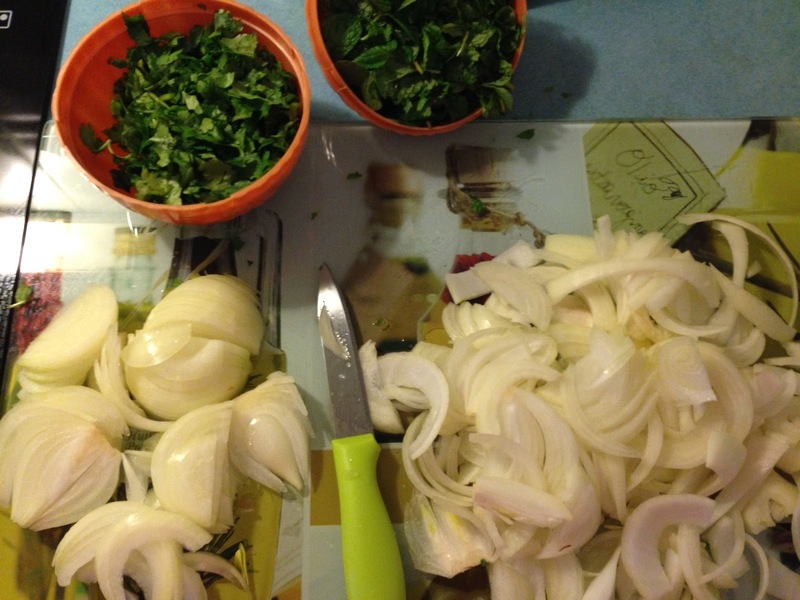 Add ¾ of the coriander & mint leaves & mix well. Add the marinated chicken & make sure you scrape all the juices from the bowl. Mix the marinated chicken with the spice mix in the pot. Cook covered for 5-7 mins, or until chicken is tender. Add a little water if the mixture is getting too dry. Soak a few strands of saffron in 3 tsp. lukewarm water. 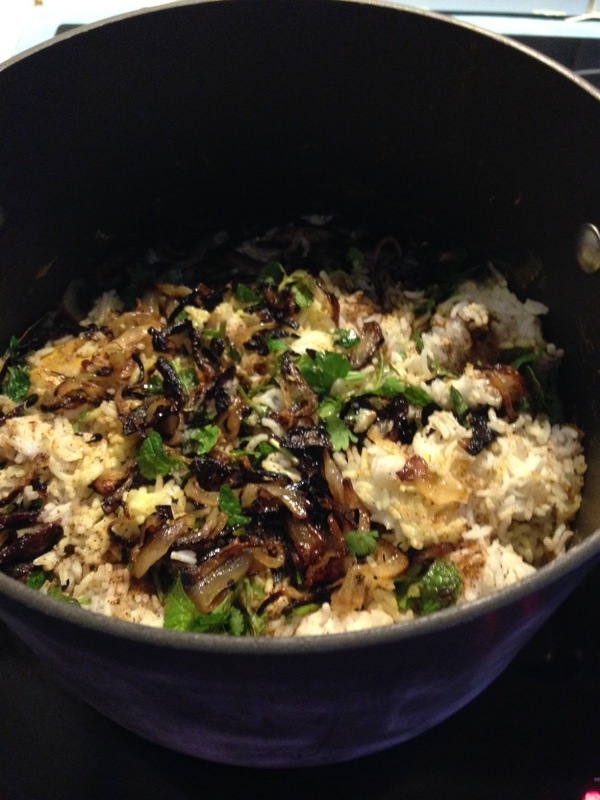 Remove the bay leaf & the spice pouch from the rice and throw it away. Layer the flavored rice on top of the chicken. Sprinkle 2-3 tsp. of garam masala powder on the rice, along with a few blobs of ghee. 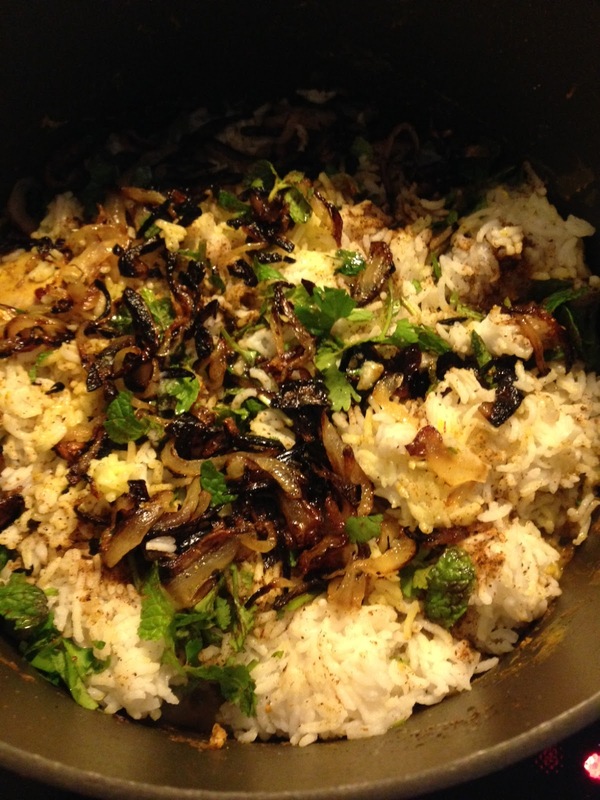 Scatter remaining coriander & mint leaves on the rice. Mix it gently, do not disturb the chicken underneath. Pour the saffron water on the rice for a nice color. Sprinkle just a few tsp. of water to ensure the rice doesn't dry out. Cook covered on low heat for 10 mins. Stir occasionally so nothing burns.Open the cover, check the chicken is cooked all the way. Thinly slice a large onion. Fry it in 2-3 tsp. oil in a non stick pan till it gets crisp. Biryani always needs to be served by scooping out the chicken from the bottom so you get the chicken with rice on the top. Sprinkle the fried onions and serve hot with some cool raita and pappadum. The key ingredients are mint leaves, coriander leaves and key step is marinating the chicken.So try to use the fresh herbs.